Regional publisher Newsquest has launched a new free weekly newspaper under the banner of a sister daily title. The 64-page Mid Sussex Argus went to press for the first time last week, replacing existing free weekly the Mid Sussex Leader. The move is part of a strategy to bring the Leader branding into line with that of Brighton-based daily The Argus. It will also see the South Coast Leader relaunch in three weeks as the Lewes and South Coast Argus, while the Brighton & Hove Leader has ceased publication. It says the savings made from the Brighton & Hove Leader’s closure will be re-invested into the Thursday edition of The Argus, which now covers a wider area of the Sussex coast as far as Worthing. The new title will come under the auspices of Andy Parkes, group managing editor for Newsquest South London and Sussex. The Argus itself is currently awaiting the appointment of a new editor following the departure of Mike Gilson in December and his successor Lucy Pearce currently working her notice. Said Andy: “I’m delighted to be involved with launching this great new paper for Mid Sussex. “I couldn’t be more proud of the first edition – I’d like to thank my team for getting behind this exciting new project right in the heart of Sussex. “We’re led by our readers and they’ve been incredibly supportive of this new newspaper covering everything in their local area. Tony Portelli, managing director for Newsquest South London and Sussex, said: “I am immensely proud of this new title which has captured the imagination of advertisers and will bring the Argus brand to a wider audience with a bespoke editorial offering. Actually someone who lives there tells me there is not a huge amount of news from Mid Sussex in that edition. The Argus brand, once so strong, is sadly no longer iconic, certainly outside Brighton, which is why NQ are resorting to desperate measures. Will be interesting to see how JP react to this as I think they have a weekly on that patch. 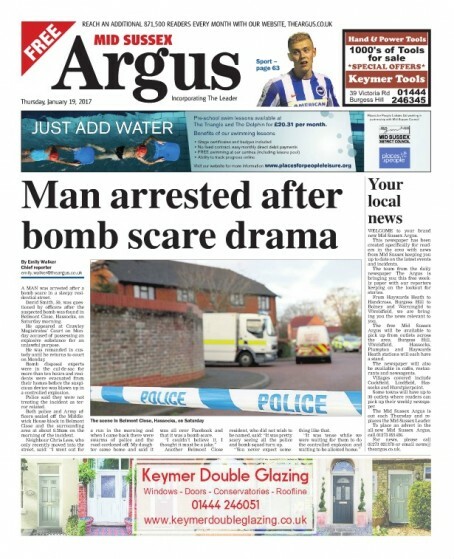 I’m confused – the Argus (by which I mean the original, daily, paid-for paper) theoretically covers the whole of Sussex. While in practice, it rarely covers the whole county, Worthing has always been one of its core areas. I believe Newsquest are trying the weekly model out in other centres too. I can’t for the life of me think why they are putting out the feelers with weekly products. One thing’s for sure, they couldn’t possibly be looking at pulling the plug from their thriving daily newspapers. Could they? Slowly rolling out the Argus as a weekly then! Wonder what they are telling newsagents who are probably selling the Brighton version on Thursdays while towns are littered with free Mid Sussex copies? I noticed a couple of weeks ago that The Argus was available free in some Worthing supermarkets, whilst still on sale in other outlets, I thought it was on a Wednesday, but it may have been a Thursday. I mentioned this to my local newsagent, he wasn’t pleased that his customers had to pay 65p for it from him, or pop in a supermarket & get it for free. UPDATE – Just checked with a contact that works for The Argus, the Thursday edition of the main daily Argus is free every week from certain outlets in Brighton, Worthing & surrounding areas. I tried getting more info out of ‘Select-Self Distribution’, who has exclusive contracts to handle free pick-up titles with Asda, Tesco, Sainsbury’s & Morrisons, and we use for HERE & NOW, but he wouldn’t disclose anything beyond the fact that they handle it in certain stores. I certainly spotted it free in Sainsbury’s & Morrisons a couple of weeks ago, but it wasn’t free in Tesco today.